George Graham Reviews Steely Dan's "Two Against Nature"
The history of any rock band almost inevitably leads to the terminal event: the breakup. Perhaps it's creative differences, sometimes a key member will leave, or perhaps it's just reality setting in for a group which had outlived its creative usefulness and was abandoned by fans. But in these days and times, the breakup of a band does not mean the end. With many Baby Boomers continuing their enthusiasm for music, there has been an ever growing number of reunions, some motivated by pure business, with others prompted by healed rifts and a realization that the whole is bigger than the sum of the parts. While there have been some dubious reunions -- Kiss stands as a salient example -- other musical re-associations have been welcome, and in some cases, pleasant surprises. If there was ever a feasible reunion that has been welcome by long-time fans, it's that of Steely Dan, who have just released Two Against Nature their first album of new material together in over 20 years. One of the most acclaimed groups of the 1970s, Steely Dan combined a jazzy sensibility with clever, sometimes jaundiced lyrics, and created an instantly recognizable sound starting with hits like Do It Again and Rikki Don't Lose That Number, and soon evolving from a regular band to the creative projects of Walter Becker and Donald Fagen, as realized by some of the best studio musicians in the business. The pair became notorious for their perfectionism in the studio, but were also widely praised by critics, and attracted a devoted fan base. Following their album Gaucho, released in 1980, Becker and Fagen went their separate ways, essentially feeling that they would have a hard time topping what they had done, and also realizing that the music scene at the time, dominated by post-punk new wave, was hardly conducive to Steely Dan's brand of sophisticated, multi-layered music, that was primarily created in the studio and not taken out on tour. In 1983, Donald Fagen created perhaps the ultimate Steely Dan-like album, The Nightfly, which remains a classic. But then both Fagen and Becker released solo albums in the early 1990s that were clearly not up to their previous standards. The duo had been working together on and off, though it was made more difficult with Fagen in New York, and Becker living in Hawaii. But the pair continued their association and worked on material, creating both fragments and complete tunes. During the mid-1990s, they decided to tour with a band, though they mainly reprised their older material. A live CD resulted. By the about 1997, Becker and Fagen began to consolidate the material they had written, flesh it out and head into the studio in New York. Producing themselves, and working with Roger Nichols, who had engineered most of the classic Steely Dan albums, their efforts have finally yielded Two Against Nature. 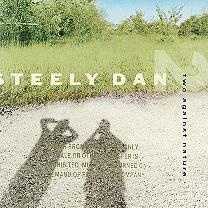 Like most Steely Dan albums the result is worth the wait, though 20 years is rather a long hiatus. The duo take up where they left off, come up with some excellent songs, and employ some first-rate studio players to make an album that's got all the qualities that make Steely Dan's music distinctive -- musically sophisticated, jazzy, rhythmically infectious, and lyrically clever. Their songs introduce us to a new batch of rather unsavory characters who generally try to get by in the world, while musically, they live up to their stated goal of creating harmonically interesting music, that is, songs with lots of unconventional chord changes, which has always been their trademark. While Walter Becker handles most of the lead guitar duties this time, rather than relying on a series of guest guitarists, the other personnel varies quite a bit. The Steely Dan albums of the 1970s relied on the cream of Los Angeles musicians, but this is very much a New York album, and they draw on players based there. Featured prominently is jazz saxophonist Chris Potter, and another mainstay is trumpeter Michael Leonhart, who helped to write the horn arrangements. But there are six different drummers divided among the nine tracks on the CD. One of my criticisms of Donald Fagen's 1994 CD Kamakiriad was that it did not seem to move forward creatively or even sonically from The Nightfly over a decade earlier. But in the context of pop music in the year 2000, the classic Steely Dan sound, even to the point of borrowing a couple of riffs and chord changes from past work, seems most welcome. And the material they create for this CD does not disappoint. Despite the fact that there are six drummers taking turns, about my only criticism of this album comes from the way the drums are handled. Though Steely Dan used the drummers and recorded them live in the studio, they then went back and looped and sampled those drum tracks, presumably to allow them to change the arrangements without re-recording. But the result is a bit stiff rhythmically, and there is almost none of the variation in the sound of the drums that a good drummer would provide to create interest. Steely Dan used this same technique when sampling was just getting started, on their last album Gaucho, but in the year 2000 when drum loops seem to be the rule, doing something different would have helped set this album apart further. Steely Dan's new release Two Against Nature, their first studio album of new material in twenty years, is absolutely first rate. Fagen and Becker's writing is some of the best they have done, the arrangements are stellar, and the performances by the gathered players are fully up to Steely Dan standards. While it could be argued that the duo has not really broken any new stylistic ground on this album, hearing them do what they did so well in the 1970s, and coming up with some of their best quality material both musically and lyrically, is cause for celebration. It is especially welcome now two decades on, given the context of today's teen-pop dominated commercial music scene, which seems only to be getting dumber and shallower. Given that environment, it's unlikely that Two Against Nature will become much of a hit, but for the many Steely Dan fans out there, who have been anticipating this album for so long, it is definitely not to be missed. Sonically, the CD is up to Steely Dan's meticulous standards. The mix is excellent with subtle touches in the horn arrangements being especially well handled. But the drum sound, much of it assembled from loops and samples of the drummers engaged for the sessions, is a bit too clinical both rhythmically and sonically. The album was apparently mixed and assembled via computer, something that is becoming increasingly common these days. While some rock reunions provide a reminder of why the group broke up in the first place, the return of Steely Dan with a new studio album is a most auspicious event.